← Oh no! I killed the children’s plants. What fun! The congregation where I serve was awarded a 2015 Greening Sacred Spaces Award (South Halton Peel Chapter). The best part wasn’t winning, though. 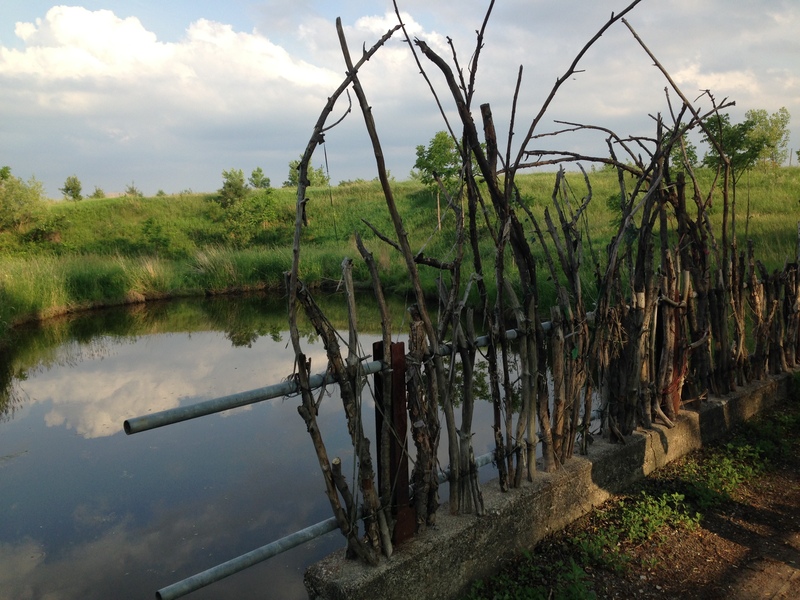 It was enjoying an incredible summer evening at Joshua Creek Heritage Heritage Art Centre. The e vent was hosted by Greening Sacred Spaces (GSS), a Canadian program that seeks to recognize and resource faith communities as they honour the earth. It is part of a wider organization, Faith and the Common Good (FCG). If you haven’t heard of it, have a look here. It was an honour to even be nominated for an award, which was given to two faith communities who strive to care for God’s creation, because so much great local work is being done. We were selected because we have the community garden out front, of course, but we also compost and recycle, have programmable thermostats and partner with Food for Life, which diverts tonnes of good food from landfills. We have participated in the Yellow Fish Road program, and every year for twenty years we have hosted a site in the local Earth Week Clean Up. I had never been to the Heritage Centre, and was really excited about going. About fifty of us gathered in the main room, but we barely had a moment to sit down before we were invited outsid e, into a wide expanse of green grass behind the center’s main building. There, each of us was offered the opportunity to walk an eleven circuit chartres labyrinth which has been cut into the tall grass. It is absolutely enormous–it takes at least forty five minutes to walk from beginning to end! I thoroughly enjoyed the opportunity for quiet in the midst of a busy week. The rain had cleared, leaving behind the golden sunlight of early evening. There was a beautiful chorus of bird songs and the breeze was warm. I noted the man who walked so fast it looked like he had a train to catch, and the one who clutched his umbrella the whole time (even though there was no threat of rain). I smiled as I passed the woman who must have worn the wrong shoes, because she took them off and walked barefoot instead. It was good to be in that place, at that moment. We had a leisurely hour or so before we wandered back to the sweets that had been laid out for us. And then came the next wonderful part: hearing Dr. Stephen Scharper, an author and associate professor at the School of the Environment and Department for the Study of Religion at the University of Toronto. He spoke about why it is so good for faith communities look after the environment, and with gorgeous photographs and poetry, he unpacked three important reasons: interrelationships, joy and love. Amen to all three! We were given a lovely certificate that night to recognize our achievement. What was even better was the gift of a beautiful evening. 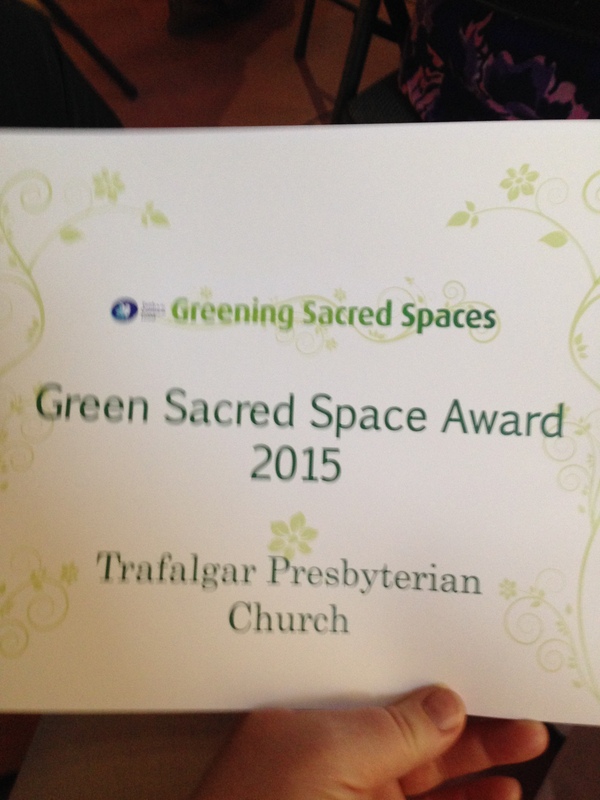 Thank you, Greening Sacred Spaces! This entry was posted in Uncategorized and tagged church, gratitude, nature, Trafalgar. Bookmark the permalink.